A first of its kind. The truly ambidextrous assisted push-button brings versatility to a new level. AXIS Assist strength with the added ergonomic benefit of the push-button. To close the knife, depress either button and fold the blade closed. 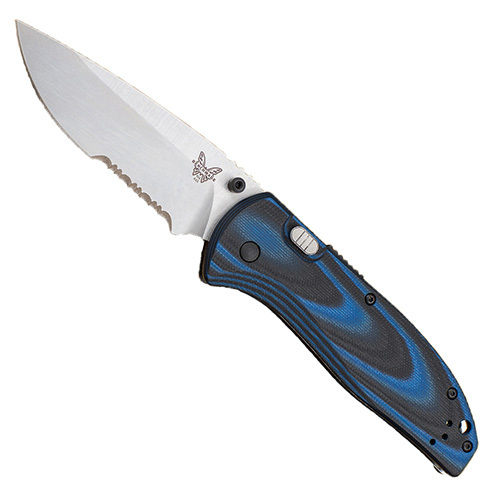 The 665 APB Assist features a 154CM stainless steel blade. This is an American-made premium grade stainless steel originally developed for tough industrial applications. Known for its best all-around qualities, it offers great corrosion resistance with good toughness and edge quality. The drop-point blade has a slow convex-curved drop in the point characterizes a drop-point blade. This blade format lowers the point for control but adds strength to the tip. It is a very popular blade shape that ranges from a slight drop to a radical downward curve providing endless styles. Drop points are a great all-around blade format.